So I'll start off the week first with a little digital scrappin' goodness. I've been enjoying doing some scrapping lately and trying to get "caught up" (like that will ever happen) with my scrapbooking. My main goal to get done before this baby comes with my is to finish my almost 5 year olds first year album. I know crazy, right? The other one is to finish my Project 365 from 2009. I know I'm ridiculous. I am making headway on Maggie's album which is wonderful! It is a little different from Ben's. Ben's album is all paper and Maggie's is a mix of paper and digital. I'm pretty sure the next baby will have an all digital album. It's just easier. Anyway, today is the start of Mouse, Paper, Scissors over at Jessica Sprague. I'm excited for this class because I've been wanting to get my hands dirty with paper, ink, and glue. It should be super fun and I'll be showing you some of the fun projects from the class. Also, my Digi in Deeper class is going well. I'm loving it! Can't tell you enough. It's just fun, but remember I'm a nerd. Lastly, if you've been wanting to become a better photographer you can sign up for Oh Shoot. It's a great class to teach you more about your camera and all the cool settings. I need to re-do this class and practice. I love taking pictures but have been kinda out of it. Okay, here are a few layouts I've finished lately. This is the fourth lesson in the Digi in Deeper Class. This week we are focusing on the Freestyle method of scrapping. It is less cutesy and way more messy and fun. I actually really like this style and wish I could naturally think of these methods in my head. I think it takes some talent to make a messy but eye appealing layout. 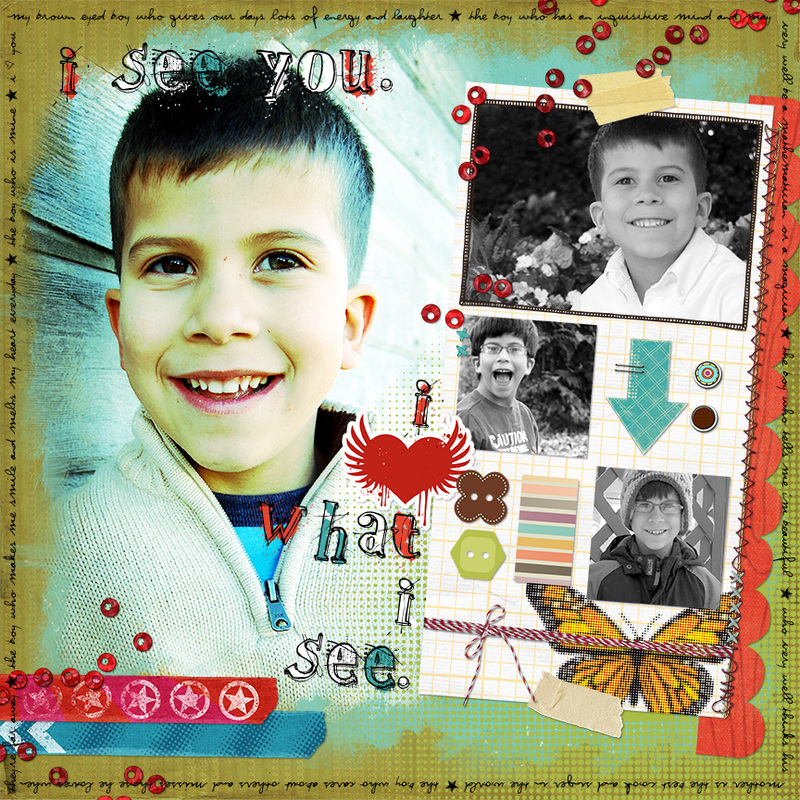 This is one of my favorite templates by Jessica Sprague. It's just pleasing to my eye. Full credits Here. This is another template by Jessica Sprague. The papers and kit are by Splendid Fiins. It's new and just released today. Check it out Here. I love seeing all your layouts. You do great work and your kids are very cute! Gorgeous layouts, as usual. And I agree...your kids are adorable! Ben looks so grown up in the first layout :(. Your layouts are beautiful as are your kids! Great layouts! I am a little frustrated right now with Jessica Sprague's website. I can not get my username and password right and it is driving me nuts! I missed out on last week's one buck Wednesday because I got so frustrated that I just gave up. Bummer because I really wanted to buy the layout they had. Anyway, good work again Moni! PS - My kids will be lucky if they get their one year album by the time they graduate from high school!